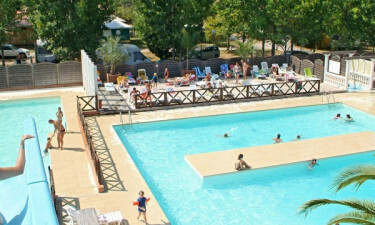 Le Fréjus is a LuxCamp site set in the heart of the French countryside. The ideal spot for a summer camping holiday, it is situated by the Côte d’Azur, one of the most popular destinations in the country, thanks to its beautiful weather and upmarket resort feel. Le Fréjus is between the forest and the coast, right by the quaint seaside town of Fréjus. The site itself is packed full of luxury camping activities, from sports to entertainment. Le Fréjus offers the perfect blend of fun and relaxation. It is ideally located for exploring the wider area, but also has so many amenities that it's possible to stay on site for the entire holiday! Why choose Camping Le Fréjus? Le Fréjus offers a wide range of facilities that can all be reached from your comfortable mobile home. It's impossible for kids to get bored here, thanks to the large sporting area that offers tennis courts, table football, boules, bike hire, and aquagym. The site offers a range of useful facilities and services to make your trip run smoothly, such as a shop, bar, Wi-Fi and delicious fresh bread delivered daily.